My immunities to any begging, pleading, cajoling or big-eyed pouty faces on the part of my children are set very high. I am nearly impervious. For many years now, one of the foundations of my parenting has been “say ‘yes’ whenever possible,” but while that lends itself fairly easily to overnights and movies and other social events, it does not carry over into catering to every whim the television plants in their capitalistic little brains. Around here, you will be clothed well, fed well, and provided with any necessary tools toward an education; but the big-ticket items will appear on birthdays and Christmas and rarely in between. Unless you earn them yourself. They know this. But it doesn’t keep them from trying. So when the phone rang the other day while Shriek and her best friend Silly were at the mall looking for new swim suits, and the caller ID displayed Silly‘s number, I knew I was in for a wheedling. The pleases have a way of chipping at the outer layer of Impervi-crust. So does the Humane Society. We’re not talking about another upgrade on the iPod, here, after all. 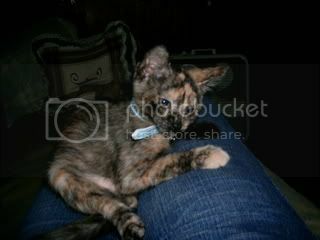 And we buried our girl-cat Lucy a few months ago… Maybe it’s time. I sent Sparky to investigate. He is a sucker for tiny fuzzy critters with big eyes, so I figured he needed some practice holding his own against those two pre-teen girls. He could also take a look at the kitten. He did more than look. *sigh* She still needs a name. Any suggestions? oh, what a cutie. Name suggestions? Maybe "Impervious"? Hmmm. Perhaps not. How about "Tigger"? No way I'd have been able to stand strong against that one, either. May I suggest "Ethel"? Or maybe "Ricky," because from one Impervi-Mom to another, I'd say you've got some 'splaining to do! She is cute, isn't she, Judy? I'm really going to have to work on my imperviousness this summer. I think Sparky needs a crash course, too. And Kalynne- that is so funny! Our boy cat is Ricky and I think he was looking for some 'splaining when she first came home. It sounds to me like Sparky has a tad less impervosity (I think I just invented a new word!) than Margy. But I feel for Sparky: I can't go to PetSmart on Human Society Days...I want to walk out with all of them--cats, dogs, gerbils, parrots, rats with fleas. I'm going to try Shriek's "Mommy" voice on my own and see if it works--there's this awesome new gadget called The Orbit I think she should get me. It's a $5,000 stroller! I'll probably end up with something $100 or less from Target, though. Amy, if anybody springs for a $5,000.00 stroller, I hope it comes with a conversion kit so that baby can drive it in sixteen years. I had terrible luck with strollers- no matter how fancy they were, they eventually lost a wheel- permanently- to a curb somewhere. Great post and cute kitty. Name her Erma of course. 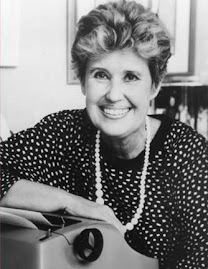 She definitely looks like an Ethel. 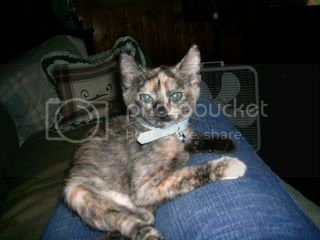 Of course I had a tortie that looked lust like her years ago and her name was Ichabod Crane, "Icky" for short. (she was one of twelve at the time….I had to quit that job at the animal hospital.). She looks like a "Spunky" to me :) Loved the post..hilarious. I knew when you sent Sparky it was all over! Oh, and I loved Impervi-Mom...LOL! Oh, Queen Goob- if anybody at my house took a job at a pet store, we'd be goners. We've got a dog, two cats, a cockatiel, and three desert tortoises already. Mrs. Q- Thanks for the suggestion, and I'm glad you liked the post! Spunky is a good description of her. We haven't finalized anything, but Shriek is starting to insist that her name is Evey. I don't know why.